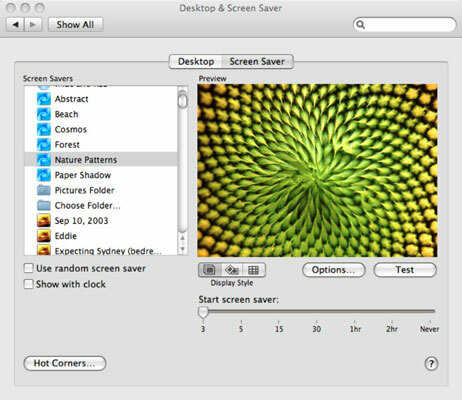 Screen savers are so-named because they were created to save your Mac’s screen from a ghostly phenomenon known as burn-in. Today, choosing your screen saver is strictly about cosmetics and personalization, in the same way you might choose a vanity license plate or a ring tone for your cell phone. 1. Go to the Desktop & Screen Saver window by choosing The Apple Key→System Preferences and then click Desktop & Screen Saver. In the Desktop & Screen Saver window, click the Screen Saver tab and click one of the screen savers in the box on the left side. Some of the pictures, such as Cosmos or Nature Patterns, are truly stunning. You can also select images from your own photo library or install screen savers created by companies other than Apple. Preview screen savers in the small screen to the right. Click the Test button to get the full-screen impact. After choosing a screen saver, drag the Start Screen Saver slider to tell the Mac to choose a time for the screen saver to start, ranging from 3 minutes to 2 hours (or never). You can also have Apple choose a screen saver for you randomly.